From June 15 to 20, Director General Suzuki, Deputy Director General Nakano, Mr. Takayanagi of the Department of Management and Mr. Katsuki of the Department of Research Programming visited the ruins in the Xinjiang area of China. Xinjiang is located in the northwest part of China, and most of the area is desert. In ancient times, various oasis city states flourished in this area; the many ruins we visited on this trip were built in that period. We toured Jiaohegucheng, the Bezeklik stone caves, the Astana ancient tombs, and Gaochang in Turfan; the Subash Buddhist remains, the Kumutula stone caves, and the Kyzyl stone caves in Kuqa; and the Museum of Xinjiang Uighur Autonomous Region in Urumqi. 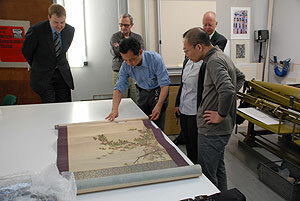 We had opportunities in each region to meet some of the people who worked on conserving cultural heritage. Although it was a short trip, it was significant in our learning about conservation of the ruins in the Xinjiang area. The Institute has accumulated various materials from its investigation and research into tangible and intangible cultural properties in various fields. As such, the Institute has invited Mr. Marukawa Yuzo, Associate Professor (by special appointment) of the National Institute of Informatics, as a visiting researcher. In cooperation with him, we are trying to determine the best method of publicizing the data on material accumulated by our Institute so that they can be used effectively. As part of this project, Mr. Marukawa presented a lecture entitled “Transmitting Information on Art Data Spread by Association” on June 23. He introduced an association retrieval system that allows cross-searching of multiple databases designated by the retrieving person. He then showed how to use the system and demonstrated association retrieval using the data owned by our Institute. We concentrate on the collection and storage of materials as basic data, and plan to more carefully examine our electronic information disclosure methods going forward. 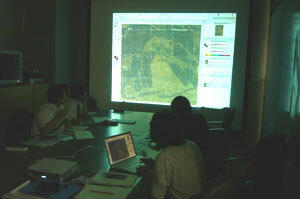 The Department of Research Programming has started a project entitled “Survey Research on Applications of High-definition Digital Images” and has proceeded with investigative research that aims to create image data that is essential for research in art history and the developmental utilization thereof. As part of this project, we concluded a research agreement with the Nara National Museum that allowed us to survey and photograph the Five Hundred Luohan stored at Daitoku-ji in May 2009 (refer to the article in the May 2009 Monthly Report). We held a research conference on June 15 to further examine the research obtained in the survey in which we invited Mr. Taniguchi Kosei, Ms. Kitazawa Natsuki and Mr. Ide Seinosuke (visiting researcher of the Nara National Museum, professor of Kyushu University) from the Nara National Museum. 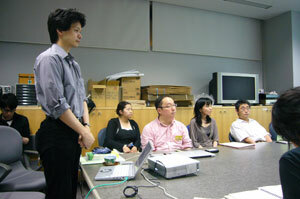 Our staff members Tanaka, Tsuda, Shirono, Torimitsu, and Tsuchiya participated as well. After the survey in May, we processed the photographed images one by one; inscriptions which were unclear during the survey became legible. At the subsequent research conference, we confirmed the inscriptions and interpreted the dates, painters, and dedicators thereof. We are planning a second survey in the coming autumn with reports to be submitted in the following years. Most importantly, Shirono reported on the factors behind the deletion of this painting’s inscription, and we reconfirmed that this survey has significant meaning. A “quick report” of the achievements of this survey and research conference can be seen at the Sacred Ningbo, the Origin of 1300 years of Japanese Buddhism: Everything Has Come from Here exhibition (http://www.narahaku.go.jp/exhibition/2009toku/ningbo/ningbo_index.html) (link rot) held by the Nara National Museum. A complete picture of the inscriptions in the Five Hundred Luohan stored at Daitoku-ji, along with the background of creation of this painting, will be revealed at this exhibition. The first time we asked Master Imai Yasuo, the eldest Noh actor of Hosho style, to record a ban-utai (singing a piece of Noh song without musical accompaniment) was in 2005. The Department of Intangible Cultural Heritage plans to record a total 100 ban (pieces) of Hosho-style Yokyoku (Noh songs) (currently 180 in number), and make two recordings per month. Hokazou, recorded on June 29, brought the number of recorded tunes to 83. The techniques of singing Noh songs have varied somewhat depending on the historical period. Master Imai Yasuo was born in March 1921, and is still active on the stage, taking over and showing us the techniques and art of the masters of the Meiji and Taisho era. 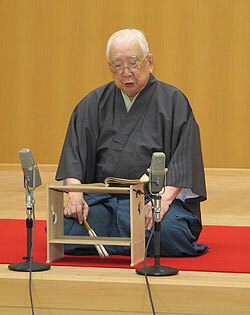 We consider this is a great opportunity to record his excellent skills, and to pass on Noh to future generations. This training course, intended for trainees who have completed the annual Seminar Course for Museum Curators, focuses on the latest research and topics related to conservation of materials. This year’s training took place on June 22 and drew 69 participants. This year’s theme dealt with the latest ideas for conserving materials on-site. One idea is energy conservation; the Center’s director, Mr. Ishizaki, gave a lecture on the current cultural heritage facility activities, both foreign and domestic, at a time when global warming is of great concern and energy conservation is desired worldwide. Additionally, the university curriculum for curators has been changed, and in three years the Material Conservation Environment Theory course will become mandatory. This means that knowledge of the natural science behind material conservation is unexceptionally essential for curators. 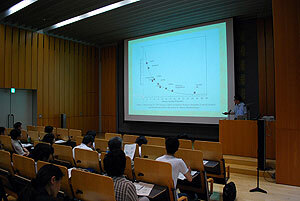 Therefore, lectures on temperature and humidity, atmospheric environment, and lighting of the conservation environment presented by Mr. Inuzuka, a senior researcher; Ms. Sano, the head of the conservation science section; and Mr. Yoshida, a senior researcher. The content was of great interest to all participants, and they were all ears. At the same time, the training also made us realize that as researchers who investigate the conservation environment, we must keep our eyes open for all responsible research and provision of information. 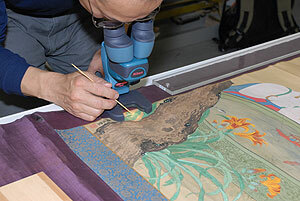 The Center for Conservation Science and Restoration Techniques continued to restore paintings in the restoration studio of Deutsches Technikmuseum Berlin this year as part of its overseas restoration work in 2009. The paintings being restored are the Darumazu (Bodhidharma in red clothes stored in Cologne Museum of East Asian Art), the restoration of which has been going on since last year, and the Karakozu (Chinese children stored in Berlin National Museum of Asian Art), the restoration of which started this year. Because of the limited space in the restoration studio, it was not possible to restore both paintings simultaneously, but restoration engineers proceeded with their work by coordinating their activities despite the humid weather in Berlin. The restoration work was completed on July 8 for the present, and we plan that this work marks the completion of the restoration of the Darumazu. The Japan Center for International Cooperation in Conservation used the government subsidized budget for the Cooperative Project for the Conservation of Cultural Heritage in West Asia and UNESCO/Japanese Funds-in Trust for the Reconstruction of the Conservation and Restoration Department of the Iraq National Museum in Baghdad in order to invite Iraqi conservation specialists to Japan for training to transfer techniques for conservation and of cultural heritage. This year four specialists in conservation – Ms. Senaa C. A. Al-Timini, Mr. Fadhil A. Allaw, Mr. Mohammad K. M. J. Al-Mimar and Ms.Baan A. M. A. Al-Jameel – have been invited from the Iraq National Museum. They will spend 3 months, from June 19 to September 18, receiving practical training on the conservation of textiles and training on equipment for conservation of cultural properties and material analysis. The program will be conducted with the cooperation of domestic institutes for conservation and restoration, including Joshibi University of Art and Design, the Nara National Research Institute for Cultural Properties, and the Shizuoka Research　Institute for Buried Cultural Properties. The 5th　mission for Conservation and Restoration of Mural Painting Fragments in the collection of the National Museum of Antiquities of Tajikistan was dispatched from May 13 to June 12. Four Tajik trainees joined in the conservation of mural painting fragments excavated from the Kara-i Kahkaha (Shafristan) site in northern Tajikistan in continuation of last year’s mission. The trainees learned how to join mural painting fragments and remove the attached gauze.The fragments that had been cleaned and joined were then put together to make a larger piece. This piece was reinforced with a triaxial woven textile made of rayon (Sakase Adtech Co., Ltd.) and then mounted on a new support. Conventionally, plaster and wood are used for support, but this time carbon fiber and synthetic resin were used to create a support that is more light-weight and that can be easily handled. This series of work was executed with the Tajik trainees for the purpose of transferring techniques to the Tajik people and contributing to capacity building in Tajikistan.